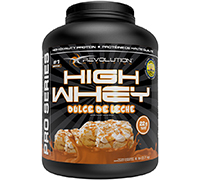 High Whey™ is a protein formula that will satisfy all your protein needs! Protein plays a key role in any balanced diet by contributing to the maintenance of the immune system functions and lean muscle mass. High Whey™ is made exclusively from carefully selected quality ingredients to ensure that you get only the best out of each and every jar! Each scoop of High Whey™ contains 22 grams of highly bio-available protein in order to provide a convenient source of protein between meals or after an intense training session. Protein needs depend greatly on your body type, gender, weight and the level of activity you maintain. Mix 1 scoop of High Whey™ with 200 ml of water or your favorite beverage. Simply blend with a spoon or use a shaker bottle for better results. Revolution Nutrition™ has earned a solid reputation as the best tasting sports supplements on the market today. We always take the time and effort to create flavors that are simply second to none so that each and every one of our consumers is always 100% satisfied. NOTE: Nutritional information and ingredients may vary from flavour to flavour..